Do you find yourself making the same New Year's resolutions over and over, but they never really get accomplished? Here are 10 simple but rewarding resolutions especially for apartment residents. 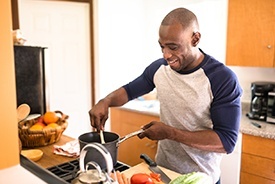 Preparing your own meals is better for your health and budget. Pinterest and hundreds of other sites are full of healthy, inexpensive, easy-to-fix recipes. Fresh flowers and houseplants accent any decor style and brighten the gloomiest mood. Find some plants that appeal to you or make a point of picking up a bouquet of flowers each week. Yes, the quality of television has improved greatly in the 21st century, but it's still too easy to turn it on automatically for mindless distraction or background noise. Digital services like Spotify and Pandora let you expand your musical horizons by discovering new artists and building your own playlists. When was the last time you read a book that wasn't required? Reading is the most entertaining way of learning about the world and its people, and with a library card it doesn't cost a cent. Living in one of our Springs luxury apartments frees you from the responsibility of funding home repairs and maintenance, but life has many emergencies in store that tend to happen at the most inconvenient time. Budget regular contributions to an emergency fund for unexpected expenses like car repairs or medical care. A plus of our on-site maintenance team is that you don't have to devote precious hours of the day to tasks like painting and yard work. Use that time to take a class in a subject that interests you, whether it's through an academic school or a community enrichment program. How many items do you have taking up space in your apartment "just in case?" Stop hanging on to possessions you'll rarely or never use and turn them into extra money by selling them on eBay or local resale shops. You don't need a lot of disposable income to contribute to a good cause. The gift of your time can be even more valuable to local organizations like food banks, animal shelters and tutoring services. The smallest kindness can have a huge ripple effect. Smiling and greeting passers-by, offering a helping hand when you can, and other thoughtful actions like these are contagious. Our Springs communities are pet-friendly because we understand the many emotional, mental and even physical benefits of pet ownership. Adopting a pet who needs a home pays off for both of you in wonderful ways. What special resolution is on your list for 2017? Tell us in the comments!